On 15 May 2018, on the occasion of a meeting of the Subcommittee on Human Rights (DROI), Mr Dolkun Isa, Vice-President of the Unrepresented Nations and Peoples Organization (UNPO) and President of the World Uyghur Congress (WUC), together with Ms Sophie Richardson (China Director of Human Rights Watch) and Mr Ulrich Delius (Director of Society for Threatened Peoples), exchanged views on the human rights situation in China, with a special focus on the so-called Xinjiang Uyghur Autonomous Region. The Uyghurs are exposed to restrictions of their rights to freedom of expression, freedom of religion and belief and even freedom of movement in China. Arbitrary detentions, in particular under the pretext of China's “anti-terrorism” law, remain widespread. Ms Sophie Richardson started the debate by giving an instructive speech on the ongoing hostility and repression targeting Uyghur people, as well as journalists and activists. She then brought to the audience’s attention the attempt by Chinese authorities to undermine the United Nations by proposing a resolution that was completely and deliberately denying basic human rights and freedoms. According to her, it is of utmost importance that the European Union acts upon this worrying develop as China is clearly pushing its authoritarianism to a new level by preventing NGOs from working on the ground, providing authorities extended and abusive powers in the name of the battle against terrorism and treating peaceful activists who promote the rule of law as criminals. The EU must seize the occasion presented by the upcoming strategical dialogue in June 2018 and the EU-China Summit in July 2018 to call on the public and high-level representatives, such as High Representative of the European Union for Foreign Affairs Frederica Mogherini, to demand that China stops violating human rights and frees peaceful advocates, including Professor Ilham Tohti and Gao Zhisheng. Human Rights Watch is deeply concerned by the human rights situation in China as a recent report confirmed the unrestrained collection of biometric data, invasive controls and surveillance, including security cameras in mosques, and even the personal presence of Chinese officials who invited themselves into Uyghur households to keep an eye on their practice of Islam and to spread the Communist Party’s ideology. Taken to the floor next, Mr Dolkun Isa stated that today’s situation of the Uyghur people is “the worst it has been in [his] lifetime”. According to him, the repression of religion has reached unimaginable and unprecedented levels, with new restrictive legislation establishing state control over every aspect of Uyghurs’ peaceful religious practice. Traditional dresses, the Quran and other religious texts, praying at home with others or holding private religious ceremonies, attending mosques below the age of 18, teaching children in the spirit of Islam, Islamic names, fasting during the Ramadan – every single aspect of Uyghurs’ religious life is considered illegal or severely restricted in today’s East Turkestan. Freedom of expression and assembly is equally non-existent. According to Mr Isa, there is a concerted attempt to culturally assimilate the Uyghur population. The modus operandi of Party Secretary Chen Quanguo – who had previously brutally stamped out dissent in Tibet – amounts to what can only be described as an unprecedented and dystopian security and surveillance regime. 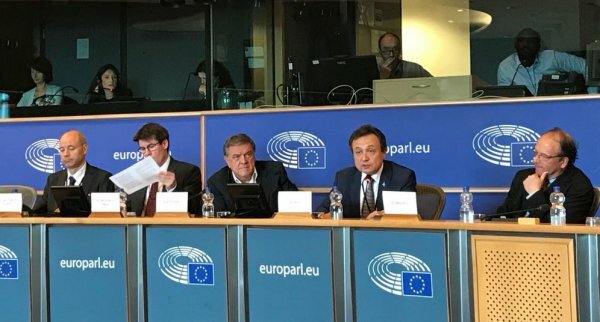 At the same time, the mass collection of personal and biometric data has led to the arbitrary detention of hundreds of thousands of innocent Uyghurs in “re-education” camps, an alarming situation against which the European Uyghur diaspora has protested in April 2018 in Brussels. Even relatives of expatriated Uyghurs are the target of threats or detained in these camps. Mr Isa continued by pointing out that international companies are also the target of China’s negative influence and invasive data mining for surveillance purposes. Companies such as Apple and Airbnb have provided China access to the Uyghurs’ data, making it easier for the Chinese government to extend its repressive grip. In Western universities, Chinese embassies are attempting to shut down academic conversations about Uyghurs, Tibet and other national groups by mobilising Chinese students through the Confucius Institutes. De facto, China is savvily using its economic leverage to determine the words and behaviour of actors not only within its border, but also outside China. In conclusion, Mr Isa called on the international community to – if it is not willing to take more decisive action – at least speak out to defend the basic principles of human rights, freedom and democracy in international institutions despite the Chinese pressure. Mr Ulrich Delius, Director of the Society for Threatened Peoples, continued the panel discussion by stating that his organisation is aware of the massive abuses and deliberate denials of all basic human rights of Uyghurs, as well as Kazakhs, Mongolians and Tibetans, despite the fact that these rights are guaranteed by international conventions, the Chinese Constitution and other national laws. Since Chinese President Xi Jinping took power in 2013, China’s human rights record has worsened significantly. According to Mr Delius, China’s behaviour can no longer be looked at through the lens of individual human rights violations, but should rather be called by what it actually is: broad-based persecution along ethnic and/or religious lines. Uyghurs or Kazakhs are falsely labelled and treated as potential supporters of terrorism. Even high-ranking indigenous Communist Party officials or leading representatives of the local administration are systematically arrested, put on trial and sentenced to long prison terms. Almost on a monthly basis, new laws and decrees are issued to limit freedom of opinion, movement and religion for Muslim Kazakhs and Uyghurs. He added that in no other region or province of the People’s Republic the authorities are trying to impose total control on such a massive scale. Xinjiang has become a laboratory for China’s high-tech industry to develop new tools aiming to prevent public protests by using artificial intelligence. Young Kazakhs or Uyghurs today have no chance to exchange their opinion via social media or the Internet, a fact which sends an extremely negative message to all those young Uyghurs and Kazakhs who are striving for and actively working towards inter-ethnic understanding with the dominant Han-population and for Uyghur rights in the context of Chinese laws and the constitution. For a long time, forced assimilation has also been an issue for Mongolians in the Inner Mongolian Autonomous Region. The region plays a major role in the production of coal, gas and rare soils, which is part of the sad explanation why Mongolian herders are being forcibly relocated and their environment massively polluted. Chinese authorities are enforcing an isolation of Xinjiang, Inner Mongolia and Tibet by preventing studies and foreign contacts for students and the local population and by denying foreign journalists, NGO researches and UN human rights experts access to these regions. Persecuted Uyghurs, Kazakhs, Mongolians and Tibetans urgently need more awareness for their dire situation and international support. As expressed in Mr Delius; statement, the Society for Threatened Peoples calls upon the European Parliament and the European External Action Service (EEAS) to address the failure of China’s nationality policy and urges the EU to insist on free access for journalists and human rights experts to Xinjiang, Inner Mongolia and Tibet. Following the other panellists’ statements, MEP Lars Adaktusson (EPP), on behalf of the Vice-President of the DROI Subcommittee, MEP Lazlo Tokes (EPP), reaffirmed his concerns about the human rights situation in China. He expressed the Committee’s fear that the country’s rich cultural heritage is being sacrificed for the sole benefits of an authoritarian system. According to MEP Adaktusson, the EU must continue to help provide assistance and raise awareness about these issues and urge the Chinese government to release all those detained, in line with what – at least on paper – is enshrined in China’s very own Constitution. When the discussion was opened to the audience, MEP Barbara Lochbihler (Greens/EFA), DROI Vice-Chair, asked for more information about the “re-education” camps and their purpose, as well as the Chinese government’s motivation for setting them up. She also asked if the situation in the prisons of other regions in China was comparable to those in Xinjiang (including no access to basic healthcare, solitary confinement, etc.). MEP Lochbihler highlighted the role the EEAS should play in addressing the situation and asked for ways it currently gathered information. UNPO would like to thank the speakers who partook in this very important and timely event and the members of the DROI Subcommittee for organising it. An obvious conclusion to be drawn from the discussion is that – while the successful event was a step forward to raise awareness of the Uyghurs’ and other Chinese national groups’ plight – for the situation to change, concerted efforts and swift action by all actors involved are urgently needed.